This is basically a summer training report on "SCADA & Programmable Logic Controller (PLC)" done by Electronics student. This project report tells about the SCADA and PLC systems in the relation to their architecture, their interface to the process hardware, the functionality and their use in industrial applications. Some attention is also given to the industrial standards to which they abide their planned origin as well as the potential advantages of their use. You can also subscribe to FINAL YEAR PROJECT'S by Email for more such projects and seminar. A Programmable Logic Controller, PLC, or Programmable Controller is a digital computer used for automation of industrial processes, such as control of machinery on factory assembly lines. The main difference from other computers is that PLC is armoured for severe condition (dust, moisture, heat, cold, etc) and has the facility for extensive input/output (I/O) arrangements. Programs to control machine operation are typically stored in battery-backed or non-volatile memory. A PLC is an example of a real-time system since output results must be produced in response to input conditions within a bounded time, otherwise, the unintended operation will result. The use of the PLC has evolved over the time to include sequential relay control, motion control, process control, distributed control systems and networking. The data handling, storage, processing power and communication capabilities of some modern PLCs are approximately equivalent to desktop computers. PLCs contain input and output devices compatible with industrial pilot devices and controls; little electrical design is required, and the design problem centres on expressing the desired sequence of operations in ladder logic (or function chart) notation. PLC applications are typically highly customized systems so the cost of a packaged PLC is low compared to the cost of a specific custom-built controller design. For high volume or very simple fixed automation tasks, different techniques are used. SCADA is an acronym for "Supervisory Control and Data Acquisition", which is widely used in industry. SCADA systems are now also now used in the experimental physics labs for the controls of ancillary systems such as cooling, ventilation, power distribution, etc. More recently they were also applied to the controls of smaller size particle detectors such as the L3 moon detector and the NA48 experiment, to name just two examples at CERN. SCADA systems have made considerable progress over the recent years in terms of functionality, scalability, performance and openness such that they are an alternative to in-house development even for very demanding and complex control systems as those of physics experiments. 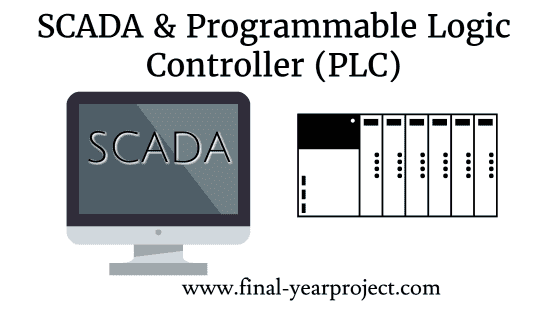 This project report on "SCADA and Programmable Logic Controller (PLC)" covers features of PLCs, PLC compared with other control systems, digital and analog signals, programming, Ladder Logic, Program for Start/Stop of Motor, the meaning of SCADA, architecture, functionality, application development, evolution and many other things. Would request you to use this report for your reference and study only.